With dry conditions a concern in many areas of western Nebraska, estimating potential wheat yields can help you determine whether recropping is necessary. With the lack of precipitation in late summer and fall in many areas of the state, winter wheat stands in some fields are questionable. This may be especially evident in continuous cropping situations. Winter wheat seasonal water use varies widely due to weather conditions, but generally it needs 16 to 24 inches. Using the midpoint of 20 inches, water use would be 4 inches from emergence to start of spring growth, 4 inches from start of spring growth to jointing, 2 inches from jointing to boot, 2.4 inches from boot to flower, 3 inches from flower to milk, 1.6 inches from milk to dough, and 3 inches from dough to maturity. Normally, it takes about 4-7 inches of water to get yield. For each inch of water above that, yield increases an average of 4-6.5 bushels per acre. Dry conditions last fall and winter may contribute to crown and root disease since dry soil warms up and cools down six times faster than moist soil. This alternating freezing and thawing will diminish the health of the wheat plant, damaging stands and decreasing yields. Wheat growers frequently need to estimate wheat yields in the spring to decide whether recropping is necessary. Determining a reasonable estimate of wheat yield allows growers to predict if it is in their best interest to destroy the wheat and plant a summer crop or leave the wheat for harvest. In areas of the state with little soil moisture, the chance of a spring crop being successful is limited. Before making such a decision, growers should be aware of any restrictions imposed by government programs, crop insurance, or previous herbicide use. Several methods can be used to estimate winter wheat yield potential. I will discuss two, both of which rely on several assumptions that may not be accurate for every season or situation. These assumptions are that 1) plants are healthy, 2) soil moisture and nutrients are adequate, and 3) weeds, insects, and disease are not affecting yield. Added to the uncertainty of yield estimates is wheat's ability to compensate for changes in the environment. there is an average of 16,000 kernels per pound. 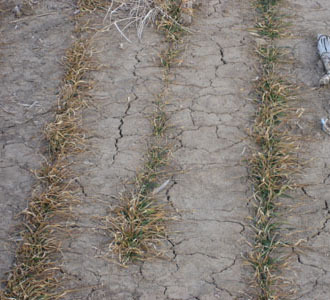 Late-planted wheat and wheat seeds that do not germinate until later because of dry conditions will tiller less and have fewer heads. To use Table 1, count the number of plants per foot of row. It is best to use at least five feet of row in at least five sites within the field and calculate the average number of plants per foot of row. If the stands are uneven, for example the stand is better or worse in the wheel tracks, make sure your percentage of samples in these areas accurately represents the proportion of theses areas in the whole field. Locate the column in the table that corresponds to your average number of plants per foot of row and then move down that column until it intersects with the row corresponding to your row spacing. This is your estimated yield. Table 1. Estimated wheat yield potential. Table 2. Estimating winter wheat yield after stem elongation for the Nebraska Panhandle*. * This table was developed using data collected in the Nebraska Panhandle. For other Nebraska locations, multiply the yield in the table by the following factor: southwest Nebraska – 0.9, central and south central Nebraska – 0.85, and southeast Nebraska – 0.75. Table 2 was developed using data collected from 1994 to 1998 on Nebraska Wheat Quality Tours. These tours were conducted near May 1, prior to head emergence in most of the state. Factors such as heavy weed, disease, or insect infestations or inadequate soil moisture at the time of the tour may suggest fewer final heads and a lower yield potential than indicated in the table. In addition, the table becomes unreliable in situations of extremely low or extremely high tiller counts, or in years when crop development as of May 1 is well ahead of or behind normal. For later season yield estimates, yield predictions can be made by substituting the actual number of heads per foot for tillers per foot. To use Table 2, count the number of tillers per foot of row. Again, it is best to use at least five feet of row in at least five sites within the field and calculate the average number of plants per foot of row. Be sure sample sites are representative of the field. Locate the column in the table that corresponds to your average number of tillers per foot of row and then move down that column until it intersects with the row corresponding to your row spacing. This is the estimated yield. Although these multipliers may appear to be in error - everyone knows that wheat fields in the semi-arid Panhandle usually yield less than fields to the east - on a per head basis the multiplier is correct. Wheat fields in the sub-humid portions of the state produce more heads per acre, but typically fewer kernels per head than in the Panhandle. For example, if your winter wheat field is in southwest Nebraska and you have an average of 30 tillers per foot of row, and your row spacing is 10 inches, multiply the table results of 40 bushels per acre by 0.9 to get a yield estimate of 36 bushels per acre. For more information, see Estimating Winter Wheat Grain Yields (NebGuide 1429).